Long before European colonists reached the Americas, native people lived in Winchester, Virginia. Located in the fertile Shenandoah Valley, Winchester was an ideal place to grow crops and was an entry point into the sacred buffalo hunting trail, “The Great Warrior Path,” that spanned from Philadelphia, Pennsylvania, to Georgia. The colonies of Virginia and Maryland and the Iroquois Six Nations agreed to the Treaty of Lancaster in 1744, which established the colonies’ rights to the path, and the road later became known as “The Great Wagon Road.” It served as a major thoroughfare for merchants and settlers, often coming from Pennsylvania. Frederick Town was incorporated by the Virginia Colony in 1736. Colonel James Wood designed the layout for the town and served as the court’s first clerk. When the Virginia House of Burgesses granted the town its fourth city charter in 1752, they renamed it Winchester after Wood’s hometown, Winchester, England. A young Colonel George Washington had his headquarters in Winchester during the French and Indian War and from 1758 to 1765 served as the Representative of Frederick County in the Virginia House of Burgesses. Jews have had connections to Winchester dating back to colonial times. Winchester is home to an active Jewish community today. Joseph Simon, brothers Barnard and Michael Gratz, and David Franks of Lancaster and Philadelphia were all involved in trade and land speculation along the western frontier. As early as 1760, Simon traded with Indians for furs in Winchester and maintained close ties to the town for many years. During the Revolutionary War, Franks, a British loyalist from Philadelphia, was tasked with providing goods for British prisoners, 30 of whom were held in Winchester. According to an American Jewish Historical Quarterly article from 1910, Lewis Barnett was a Jewish member of the Winchester Masonic Lodge in 1808. Little is known about Barnett and there is no record of other Jews living in Winchester during this period. Due to its location, Winchester has long been a commercial hub for the Shenandoah Valley. Construction of the Winchester and Potomac Railroad in 1836 upgraded transport to Philadelphia and Baltimore and since Winchester was the last southbound stop in the Shenandoah Valley, it rose in commercial importance. Before the Civil War, the city’s main exports were wheat, furs, and hides. Although the town was decimated during the Civil War, its central location spurred its economic recovery as factories and mills were established in the late 19th century. Commercial apple orchards also emerged as a main industry in Winchester. Not until after the Civil War did a significant number of Jews settle in Winchester. Among the first was Joseph Hable who moved from Baltimore in 1870 to open a store. 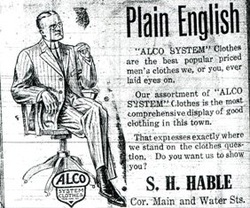 Two years later, his brother Solomon joined him and opened his own clothing store, S. H. Hable. While Joseph moved to Fredericksburg, Virginia by 1880, Solomon stayed in Winchester, establishing himself as a successful businessman. In 1923, the Winchester Star, the local newspaper, declared that S.H. Hable was the oldest retail clothing store in town. The store had grown from its original 1,200 square-foot space to a three-story, 9,000 square-foot store and was known to ship clothes throughout the region. By 1878, only 19 Jews lived in Winchester. Several more moved in the late 19th century and worked as merchants, including Charles and Isabella Heller, who came in 1887, and Samuel and Emma Rosenmeyer, who arrived in in 1897. By the end of the 1900s, the Jews of Winchester were holding religious services. In 1910, Mendel Cohen invited Rev. M. Paul to come to Winchester to lead the town’s first High Holiday services, which were held at the home of Max Moses. Additionally, Simon Lipstein, a tailor in Baltimore and the brother in-law of Winchester junk dealer Max Novick, made the 100-mile trip and served as cantor. On Yom Kippur, the local newspaper noted that Jewish stores would be closed for the day but would reopen later that night. Among those who attended the first High Holiday services were Philip Klompus and Philip Kramer who served as the main lay leaders for the congregation for many years. Klompus moved to Winchester after the Baltimore Bargain Store helped him open the Leader Store, which sold dry goods. At first, his wife Molly was reluctant to move to Winchester because she believed it would be difficult to keep kosher. However after moving to Winchester, Philip would travel to Baltimore to buy kosher food or a kosher market in Baltimore would send the food on the train. Later on, Klompus learned the laws for slaughtering chickens and turkeys and served as the community shochet. Klompus also helped struggling Jewish peddlers who needed assistance getting to the next town. Philip Kramer worked as a junk dealer and later an ice dealer while also serving as shochet. The Winchester Jewish community grew slowly as new families settled in town. Louis Zuckerman often took his horse and buggy on the Great Wagon Road collecting glass and other goods to sell at his junkyard in Waynesboro, Pennsylvania. In 1917, he purchased a junkyard in Winchester and moved to town. He built his company, Zuckerman Auto Undertaker, later renamed L. Zuckerman and Sons, into a formidable local business, and when he was older, split the company into four subsidiary businesses for his sons. Joe ran Zuckerman Company, which was a continuation of the original business. Sam operated Zuckerman Metals Inc. in Front Royal, Virginia. Aaron had Frederick Motor Company, later Winchester Scrap, which sold used car parts and Charles received Zuckerman and Sons, which sold new steel products. Zuckerman Co. and Zuckerman Metals Inc. remain in the family and are owned and operated by Louis’s grandchildren and great-grandchildren. In 1922, Frank and Morris Lovett opened Lovett Brothers shoe store. In 1925, Louis Wender opened Wender’s Apparel Shop, a women’s clothing store. Samuel Shendow moved to Winchester in 1931 and opened Bell’s clothing store. Additionally, the children of the first Jews in Winchester expanded or started new businesses. Herman Hable managed S.H. Hable’s into the 1920s after his father’s death in 1911, however he also helped his uncle Frank Hable operate the Auditorium Theatre in City Hall, Winchester’s first movie house. During the 1920s Herman started Hable’s Real Estate and later constructed the Palace Theater in the heart of downtown Winchester. Herman screened movies and staged live performances and concerts at the theater, and on Saturday afternoons, he held amateur contests, which were broadcast for free on the local radio. It was at these contests that 17-year-old singer Patsy Cline got her start, before going on to a celebrated career in country music. Abram “A.J.” Novick, son of Max Novick, ran his own refreshment store in Winchester during the 1920s. In the 1930s, with a single 2.5 ton truck, A.J. started Novick Transfer Company and would haul woolen goods from Winchester to New York City. Because the company was created before the Motor Carrier Act of 1935, he was able to avoid government regulations and grow the business to hundreds of trucks, semi-trailers and tractors, delivering goods throughout the Mid-Atlantic and Northeast regions. With so many vehicles in stock, there was always a need to replace parts, so A.J. opened the Trucking Supplies store, through which he acquired trucking parts wholesale and also sold auto parts to customers. The store was very successful, and he opened new branches in West Virginia and Virginia. 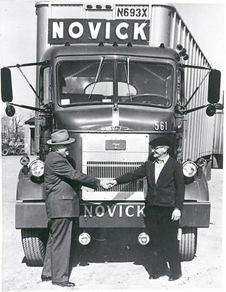 Novick’s Transfer Company remained in business until it was sold in 1965. Jews also settled in the small towns around Winchester, often opening successful businesses. The Wolfson family started making trips to the Winchester area to acquire hides and furs, which they would process and then resell in Baltimore. Sam Wolfson opened a tailor shop in Strasburg, Virginia, about 20 miles southwest of Winchester, in 1915. Sam died only two years later during a flu epidemic, and his brother Joe took over the store, later expanding it to include retail clothing. The store became a leading downtown business in Strasburg for many years. In 1934, Charles Platt purchased the Strasburg Textile Mill, which produced silk casket linings and during World War II, silk parachutes. The mill was one of the largest manufacturers and employers in Strasburg. Reuben and Jenny Kaplan also operated a department store in town. Harry Raflo, a traveling salesman for a men’s store in Philadelphia, moved to Front Royal, Virginia, with his wife Katie and bought the Boston Bargain Store in 1911. In 1933, with the business struggling through the Great Depression, their niece Eleanor Rappaport came from Philadelphia to temporarily help in the store. Temporary help turned into 70 years as Eleanor worked and then ran the store with her husband David, who died in 1976, until it closed down in 2003. By 1937, the Winchester Jewish community remained small, with only 57 people, though another 30 or so lived in Front Royal and Strausburg. Nevertheless, they began to establish formal Jewish organizations. In 1931, a group of women founded the Jewish Women’s Club, which later became the temple sisterhood. The following year, the men followed suit, establishing the Jewish Men’s Club, which later became the B’nai B’rith Lodge. Later in the 1930s, Winchester Jews finally organized a formal congregation, named Beth-El, which met for services in the Odd Fellows Hall. 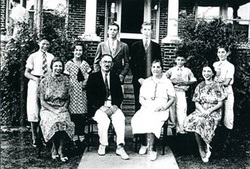 Tessie Novick started the community’s first Sunday school at her home around this time although it was not until 1950 that the congregation officially started its own Sunday school. Most of the Jewish families that moved to Winchester during the community’s formative period came from an Orthodox background. Charles Zuckerman recalls that in the 1930s, most, if not all, of Winchester’s Jewish families kept kosher. In addition to Philip Klompus and Philip Kramer acting as shochets, community members would place orders with Abram Novick, whose trucking company would bring back kosher meat from Baltimore. Lay leaders conducted all services throughout the year except for the High Holidays, when they would host a yeshiva student to conduct the services strictly in Hebrew. By the late 1940s, generational shifts and an influx of young people led to a decline in the Orthodoxy of the congregation. Born in 1922, Charles Zuckerman was raised in an Orthodox household and even while serving in the military in Mississippi observed the dietary laws. However when he and his four brothers returned to Winchester in the late 1940s, their mother, who had stressed the importance of Orthodox observance, had died, and they soon stopped keeping kosher. Seymour Barr, a New York City native, moved to Winchester in 1943 and opened Barr’s Hardware store. Seymour emerged as a leader in the congregation as it shifted from Orthodox to Reform. In 1953, Beth-El began to bring in student rabbis from the Reform seminary Hebrew Union College [HUC]. Three years later, the congregation joined the national Reform organization, the Union of American Hebrew Congregations [UAHC]. Barr served as president of the Mid-Atlantic Council of the UAHC, and he and his wife Betty were very active in the congregation for many years. 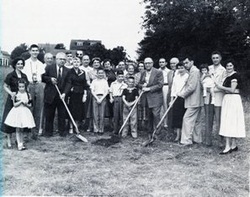 Beth-El broke ground for its first synagogue building in 1954. Overseen by Seymour Barr, construction was completed in 1956 at a cost of $55,000. For the building dedication, the congregation sponsored two nights of events. On the first night, the congregation held a traditional dedication service led by HUC student rabbi Jerome Gurland, and on the second night, held an interfaith program. Local Christian ministers, State Senator Harry Byrd, Jr., and U.S. Congressman Burr Harrison addressed the audience. An article in the following day’s Winchester Star celebrated the occasion: “The Star is proud of the splendid Jewish citizens of this community. We share with them pride in the erection of the Beth-El Temple.” The Christian community was very supportive, donating $10,000 for the building fund. From 1953 to 1965, Beth-El relied on student rabbis from HUC in Cincinnati to lead services at Beth El Congregation twice a month. In 1965, the congregation hired Rabbi Saul Besser, director of the Mid-Atlantic council of UAHC, to lead services in Winchester every other week. Laypeople continued to lead services when no rabbi was present and the five Zuckerman brothers formed a temple choir. The congregation hired Dan Isaac as its first full-time rabbi in 1991 and has hosted a full-time rabbi ever since. Lloyd Robb, originally from Brooklyn, graduated with a master’s degree in vocal performance from The Julliard School and moved to Winchester in 1963 to teach voice at Shenandoah University. After attending services at Beth El for two years, Robb assumed the role of lay cantor and served the congregation until 2005. Cantor Robb taught children to chant for their b'nei mitzvah and became an integral part of the congregation. The Jewish community flourished in the years following the opening of the temple. The presence of the synagogue helped convince Jewish families, who were otherwise unsure about living to Winchester, to move to the city. At its peak, 105 Jewish families lived in the area and 60 children attended Beth-El’s Sunday school. In 1961, the Novick family paid for a two-story wing to be added onto the temple to accommodate the growing religious school. The community acquired a Jewish section of Shenandoah National Park cemetery in the 1970s. Before then, Jews were often buried in Baltimore where they had family connections or 20 miles away in Martinsburg, West Virginia, which was the nearest Jewish cemetery. Winchester Jews have long been involved in civic life and community service. Herman Hable served on the Winchester Common Council and hosted a large annual Christmas party for local families. Many Jews joined civic organizations like the Masons and Rotary Club. Charles Zuckerman was active in the Lion’s Club and was encouraged by fellow members to run for public office. He went on to serve in city government for 24 years, spending 16 years on city council, and then serving two terms as mayor from 1980 to 1988. Zuckerman’s brother Sam served on Front Royal’s city council while Charles Platt was a city councilman in Strasburg for 16 years. Ben Belchic was President of the Winchester-Frederick County Historical Society for 28 years. 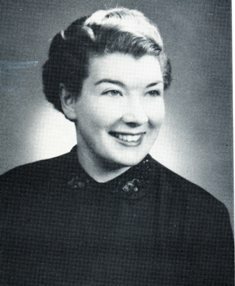 Lee Lovett, who in 1947 became Winchester’s first female lawyer and had her office in the Lovett Brothers Shoe Store, was the Justice of the Peace for many years in Stephens City, Virginia. Today, Beth-El’s Social Action Committee continues to organize service events such as the annual Migrant Workers’ Lunch and Operation Snowflake, in which Jews volunteer at Winchester Medical Center on Christmas Day to allow some of the employees to spend the day with their families. Although the apple industry has declined and many of the factories have closed down, a number of businesses have built headquarters or distribution centers in Winchester in recent years as the city continues to serve as an economic hub in the northern Shenandoah Valley. Trex, which manufactures outdoor decking, relocated its headquarters to Winchester around 2000; its CEO is Beth-El congregant Ron Kaplan. Most Jews in Winchester either work as skilled professionals, in government (Winchester is on the edge of the D.C. metro area) or for corporations. Hable’s Real Estate still owns 25% of Winchester’s downtown buildings although none of the Hables remain in Winchester. Cooper’s Jewelers, which was opened in 1959, remains in business today. With its central location, Winchester has also become a popular retirement destination, which has brought several new members to Beth-El. In 2007, Beth Jacob congregation in Martinsburg, West Virginia, closed down and some of its members joined the Winchester congregation. Today, there are about 85 Jewish families in the Winchester area and around 40 children in Beth-El’s Sunday school. Since 2010, Scott Sperling had led the congregation as its full-time rabbi. In 2013, Beth-El was in the process of making major renovations to their building, indicating that the congregation sees bright days ahead. Beth-El Congregation continues to be the center of Jewish life for Winchester and its surrounding area.